The NEW ChickSafe Extreme automatic chicken coop door opener is built for extreme weather conditions with a high powered motor and military grade electronics and coatings. Like the Premium model it is packed with some great features including an integrated timer and light sensor, full manual door control and our unique failsafe mode for that extra peace of mind giving you total flexibility over how and when you want your chicken coop door opened or closed. Running on only 4 x AA batteries (included) or by electric power via USB cable (not supplied), our Extreme pop hole door opener has been designed with ease of use in mind. The all-in-one design makes setting up a breeze - no messy wiring or limit switches to attach to your coop. Simply secure the control box to the front of your chicken coop, tie the lifting cord to your existing door, set your opening and closing preferences and you’re away. We have even made the buttons extra big so that you can easily press them with gloves on in the winter! Note. 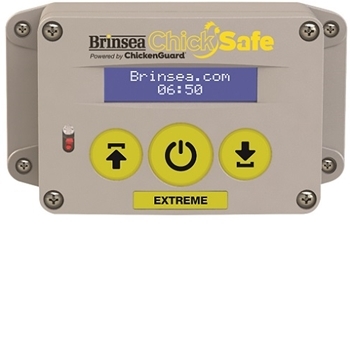 The ChickSafe Extreme opener is designed to operate with up/down sliding coop doors weighing up to 8Lbs. If your door is heavier or not of the sliding type an optional Coop Door Kit is available. I have purchased several these doors. I purchased because I can customize opening and closing to either light or time. They work pretty good most of the time. Install was a snap with first one because I was replacing a different brand auto door and used mounting screws from old unit. The Brinsea auto door does not come with mounting screws for some reason which seems no big deal until you try to find a tiny screw with small head to fit down in a very small hole, but long enough to hold unit to wall. I can't seem to find correct screws to install the 4 other doors. For over $200+, you'd think you could include 4 mounting screws. The other thing is the string that holds the door. Not sure how long that will last in the weather. Seems like a cable would be better for a $200+ unit. I sure spent a lot of money so I hope they do hold up well...once I get them all installed.